A South Korean professor has spent the past eight years teaching children with disabilities in the Central Highland province of Lâm Đồng. Dr Choi Young Sook works as a advisor for the Lâm Đồng Special Education Support Centre in Central Highlands. Dr Choi Young Sook, 60, first visited Vietnam in 2005 after working for years as a teacher at the Pusan Kuhaw School for the Deaf and lecturer at INJE University in her home country. An expert in special education, she has been working with a number of schools in Lâm Đồng Province to teach students with learning disabilities and mentor teachers. 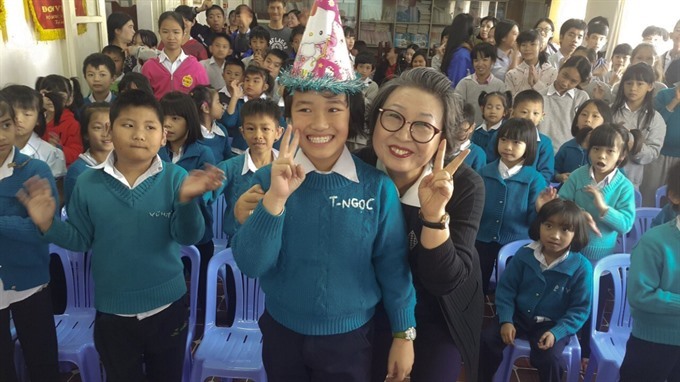 Choi said the most memorable experience she had with the children was when she taught students at the Hoa Phong Lan School for Disabled Students in Đà Lạt City to play musical instruments. “One student with autism was overjoyed hearing herself playing the rattle, so she started screaming, ran out of the room, and only came back a long time later,” she said. Apart from her work with the special schools, Choi and her husband also took part in charity projects organised by the provincial Red Cross Society. They have helped raise money to build 13 houses for people with disabilities, and give 269 wheel chairs and 400 bicycles to poor students and people of ethnic minority living in the province. “My biggest dream is to establish a development centre for toddlers and children with disabilities and to help children with developmental difficulties less than three-years-old, since children in Vietnam will not get to attend schools until they are six,” Choi said. The professor said she also wanted to establish a special job centre where those who graduate from special schools can look for employment. The centre will provide intensive job training so they can fend for themselves without having to depend on others, she said. Aware of the important role of teachers and the special skills they should have in educating children with special needs, soon after arriving in Việt Nam in 2005, Choi encouraged and introduced more teachers from South Korea to come to Đà Lạt and provide training for locals. Her latest effort was to invite 13 special education experts from the East Asian nation to come to mentor teachers from 35 special schools in southern Việt Nam last year. “I hope the quality of special education in Vietnam will continue to be improved, and that your country’s education will get better with time,” she added.